Since 1868, Scotts® has been producing High Quality Grass Seed. 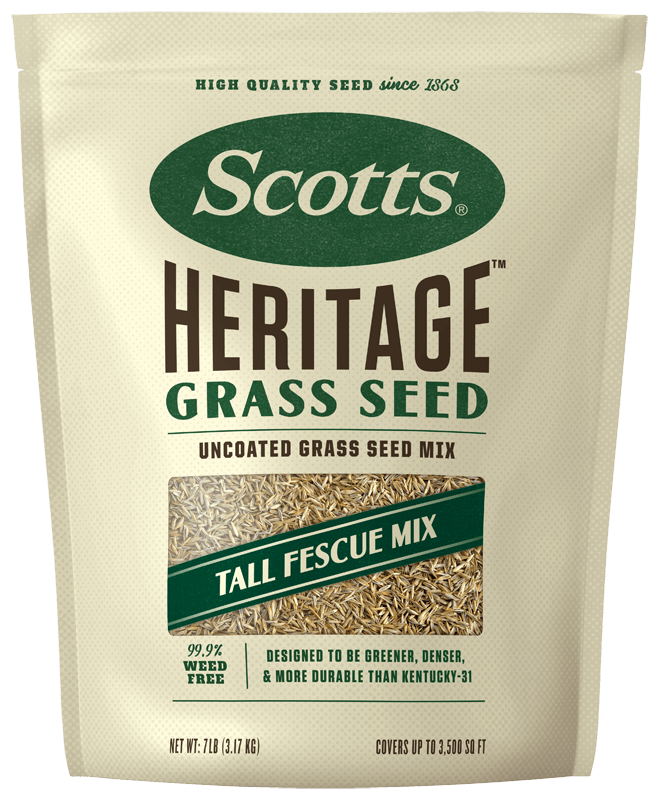 Scotts® Heritage™ Grass Seed Tall Fescue Mix continues in that tradition. This high-quality, uncoated grass seed has been designed to be greener, denser, and more durable than Kentucky-31. Provides coverage of 3,500 sq. ft. for reseeding and 1,165 sq. ft. for new lawns. Apply with a Scotts® spreader in areas that see full sun and shade during the day and you should start to see growth in 6-14 days. Great for reseeding existing lawns or seeding new lawns. Can be used in both sunny and shady areas. Prep: Rake area to loosen the top layer of soil (approximately 2" deep) and remove any dead grass or debris, ensuring seed-to-soil contact. Apply: Use a Scotts® spreader to apply the seed. There is enough seed in each package to cover a new lawn up to 1,165 sq. ft.
Rake: Lightly rake the seed into the soil to ensure that the seed is covered, but is just beneath the soil surface. Water: Water daily, or as needed, to keep the soil surface moist until the seedlings reach at least 2 inches tall. Prep: Mow lawn at the lowest setting and bag the clippings. Rake to remove debris and dead grass, and loosen the soil, ensuring seed-to-soil contact. Apply: Use a Scotts® spreader to apply the seed. There is enough seed in each package to reseed up to 3,500 sq. ft.
Rake (Optional): Lightly rake the seed into the soil to ensure seed is covered just beneath the soil surface. If for any reason, you the consumer, are not satisfied after using this product, you are entitled to get your money back. Simply send us original evidence of purchase and we will mail you a refund check promptly. Do not walk on your new lawn until it is established. Before applying, mow the lawn at the lowest setting and bag all of the clippings. After opening the package, use the seeds within the season. Water daily or as needed to keep the soil surface moist until the seedlings reach at least 2 inches in height. Specially designed to promote grass seed germination, the first step in seeding success. Lawns seeding projects come in all shapes and sizes, from fixing small bare patches to complete lawn do-overs. Here are some tips to ensure you are able to grow new grass right the first time. Here's a list of the most frequently asked questions about grass seed from consumers like you.